‘ And then…God created Women and the world was never ever the same.’ Though people chose to blame women for all the chaos on this earth I think it is women who actually add a sense of calm to the otherwise chaotic ways of this world. This book, Fractured Legend, is woven around the lives of three women who are clinging onto the tiniest hope they have with all their grit. An interesting attempt by a first timer at capturing the various, mysterious forms of women! Fractured Legend is the story of three women who are sailing away from their turbulent pasts, the denouement puzzlingly curling them all together into one tight ribbon of hope. 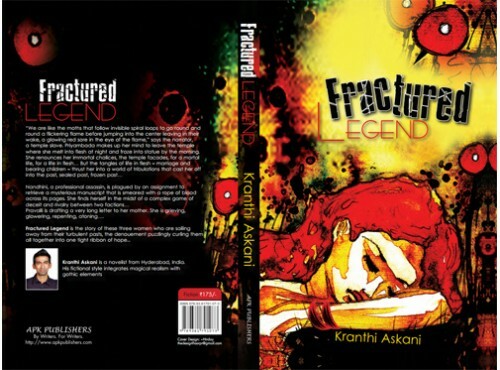 Kranthi Askani is a novelist from Hyderabad, India. His fictional style integrates magical realism with gothic elements. P.S: The author has autographed the books that have been sent for review. It truly feels special when the moment you open the book you see few lines scribbled for you with the author, Kranthi Askani’s autograph. This was a wonderful gesture from the author’s side and I truly appreciate it. This act shows that he values his readers and wanted to express his gratitude by making them feel special with this. Three different women…. Three situations…. One strength – hope….. One story – Fractured Legend. ~That is how I would like to sum up this story! Most of the time in life we know where it is all leading to, we plan, postpone and execute things so meticulously. But there are instances in life where we are left with no option but to go with the flow and just hope. Hope that it all turns out well in the end. Fractured Legend is the story about this hope. It is like that tiny flame of light ignited in a dark room to brighten it up. It has a robust storyline with a very riveting narrative. There is not a single boring moment in the book as chapter after chapter you keep on getting more and more intrigued. I fell in love with the characters of Fractured Legend. They are so well defined that it transforms you to their world as you live and breathe the same air as them. The pain and trauma borne by each one of them is brought out so nicely that it sent shivers down my spine. Somewhere in the middle of the book, I suddenly felt as if I knew these characters so well since a long time. They all seem so existent and real. My favourite is Pravalli. I shed copious tears as I turned each page of the letter she had written to her mother. I would not like to play the spoiler here and reveal any more details. But I would recommend this as a read to anyone and everyone who has a keen interest in reading resilient fiction. I would also like to add it is not light read where you can read a few pages and keep it down for a while only to pick up after sometime again. It is a book which will keep you awake late in the night with the thought what next. Even after you have finished reading this book, it haunts you for a long long time. It is not the types you would like to read before going to bed as it would keep you awake with loads of thoughts after reading it. This book has a few flaws in the grammar department which do dampen your spirit at some places as it slows down your pace to understand the correct context. 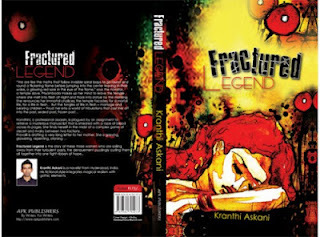 Over all, a praise-worthy attempt by first time author Kranthi Askani. This book is like jelly beans. 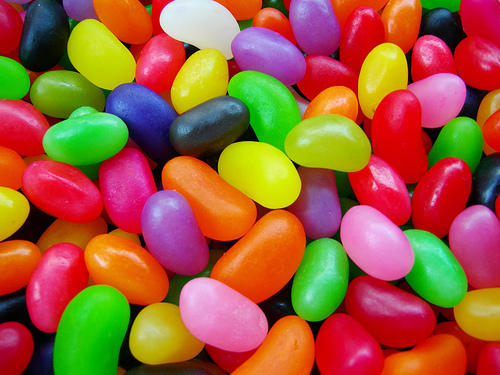 You don't know which flavour you will get next and how it will taste only to be pleasantly surprised each time. It leaves an unmatched tangy taste (Read: Mixed feelings) in your mouth(Read: Heart & Mind) after eating (Read: Reading). Sure...do let me know your views on it! Just going to check out your blog! Read your review... I can truly understand what you are saying...it is a little on the heavier fiction side ...not a light read as I mentioned!